BRAZIL AND COLUMBUS—“The cup of salvation I will raise. I will call on the Lord’s name” (Ps 116:13). This Old Testament verse has long been connected in the life of the Church to the celebration of the Eucharist. At each Mass, a priest raises up a chalice filled with wine that, by the power of the Holy Spirit, becomes the true presence of Christ. 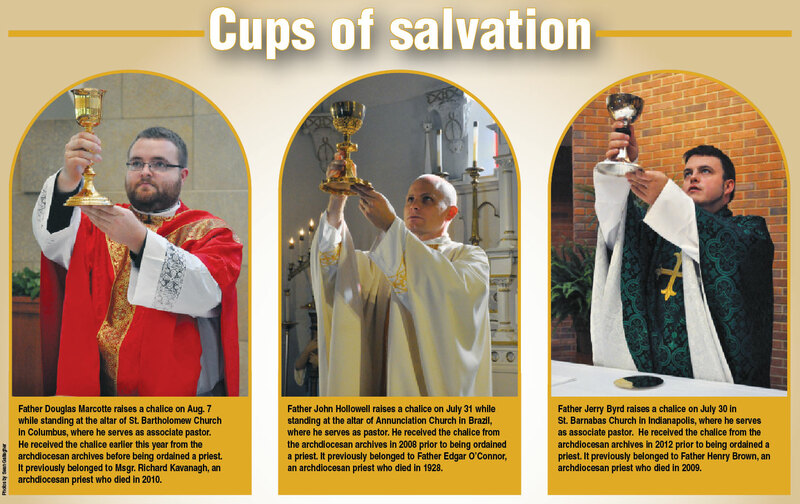 Priests throughout the 2,000-year history of the Church have raised up such cups, all of them linked together in the one priesthood of Christ. Over the past several years, priests ordained for the Archdiocese of Indianapolis have had the chance to receive a tangible reminder of that connection. As transitional deacons approach their priestly ordination, they can request to have a chalice from the archives. A condition on being given one is that the chalice will return to the archives when they die. The deacons can view the chalices before they choose one. Some of the chalices are known to have been in the possession of a particular priest. The histories of others are unknown. Prior to his ordination in 2008, Father John Hollowell chose a chalice that had belonged to Father Edgar O’Connor, a priest of the archdiocese who died on Dec. 13, 1928. As far as Father Hollowell knows, it was not used from the time of Father O’Connor’s death until his own ordination 80 years later. Father Hollowell has also experienced a connection with Father O’Connor. He also made the effort to learn more about his fellow priest. Father O’Connor was 32 at the time of his death, having been ordained in 1920. He earned a doctorate in theology in Rome, and was serving as the secretary to Bishop Joseph Chartrand when he died of pneumonia. Then-Father Joseph E. Ritter, later the first archbishop of Indianapolis and a cardinal archbishop of St. Louis, was at his bedside when he died. An engraving on the bottom of the challice shows that Father O’Connor’s parents had given it to him at the time of his ordination. This is a traditional gift of parents to a son who is ordained. Father Hollowell appreciated his parents not having to spend potentially thousands of dollars to purchase a new chalice, although they did pay to have it re-plated. An engraving of his name and ordination date was added to the base. 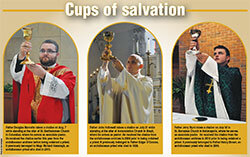 Other chalices chosen from the archives belong to priests who died in recent years. Father Douglas Marcotte, who was ordained on May 18 and now serves as associate pastor of St. Bartholomew Parish in Columbus, received a chalice that had belonged to Msgr. Richard Kavanagh. Ordained in 1936, Msgr. Kavanagh died on Jan. 20, 2010, at 98. At the time of his death, he was the longest serving priest in the history of the archdiocese. Msgr. Kavanagh led St. Michael the Archangel Parish in Indianapolis from 1951 until his retirement in 1982. He also helped oversee much of the archdiocese’s building boom in Indianapolis following World War II. After receiving the chalice, Father Marcotte learned more about Msgr. Kavanagh and now seeks to emulate him. Tom Kavanagh, a nephew of Msgr. Kavanagh, and his wife, Kay, helped care for the aged priest during the last years of his life, and were responsible for dispersing many of his possessions, including some of his vestments, after he died. Tom was gratified to learn that his uncle’s chalice continues to be used. The economics of receiving a previously used chalice compared to buying a new one played a part in Father Marcotte’s decision to receive a chalice from the archives. “I certainly think my parents were happy that they were refurbishing one instead of purchasing a new one,” he said with a laugh. At the root of his choice, however, is Father Marcotte’s desire to have a constant reminder that his life as a priest is but a small part of a longer history of ordained ministry. The idea that the chalice he received from the archives might be used by another priest after he dies pleases Father Jerry Byrd. Prior to his ordination on June 2, 2012, Father Byrd chose a chalice that had belonged previously to Father Henry Brown, who died on June 21, 2009. Ordained in 1951, Father Brown ministered in parishes and hospitals across central and southern Indiana until his retirement in 1998. After moving into the St. Paul Hermitage in Beech Grove, he continued ministering to his fellow residents for many years. “How many people did he minister to in his life?” Father Byrd wondered. “We’ll never really know how many lives he touched, how many Communions he gave, how many Masses he celebrated using that chalice. We’ll never know. The only one who really does know the impact that he had on the world is God himself. In using a chalice that was used decades before he was born, Father Byrd has a keen reminder of the eternal nature of his vocation. “That chalice existed before I did,” said Father Byrd, who also serves as a chaplain at the University of Indianapolis in Indianapolis. “That chalice was being utilized in the ministry that God created me for before I was created. And so to be able to participate in that is a constant reminder that all I had to do was to say ‘yes’ to God and he would provide everything else that I would need.